Sometimes we need just a little to go a long way. Take little Mikey at out Therapeutic Childcare, for example. Early on, Mikey suffered from neglect that caused him to be left in a crib for over a year. After his grandparents and siblings became homeless, Mikey started spending much of his time in a stroller on the San Diego streets. He came to us at 18 months old delayed in all areas of development. He did not walk and could only stand holding on to fixed objects – a significant delay for a child his age. Mikey also avoided eye contact and had no facial expressions—both essential skills in social development and attachment. Our highly trained staff worked with Mikey in the infant room until he could learn the skills needed to be with his peers in the toddler program. With the large, open classroom space, he strengthened his muscles and practiced moving. He was also given ample opportunity to interact with adults and children, encouraging him to socialize. His grandparents were eager to help Mikey progress in his development. Both worked tirelessly alongside teachers and clinicians practicing his new skills and engaging him with our on-site speech therapist. In just two months, Mikey surprised all the Therapeutic Childcare staff by walking into the lobby on his own with no hands for support. 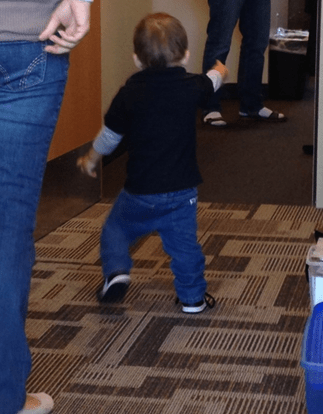 Not only was he walking, but he was seeking out eye contact from adults, smiling and even laughing! Like all of the children in our Therapeutic Childcare Program, Mikey received the outpouring of attention and support he needed from our dedicated staff and licensed therapists.